If you would like to install yourself you are welcome to buy the complete parts from us. We can supply our Top Mount Clamps in Coring or Drilling install configurations. 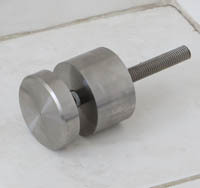 For Drilling we supply a M16 tap at the bottom of the clamp with a 100mm M16 Stainless Steel threaded rod.